The BIS label continues to do well by James MacMillan. This is their ninth release dedicated to his music, and, as with those previous recordings, a new work is presented, just a few years after its premiere, in a good performance and with the benefit of the company’s trademark high-quality audio. 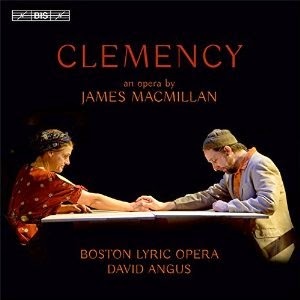 Clemency is MacMillan’s third opera, following Inés de Castro and The Sacrifice (the latter is available on CHANDOS 10572, a Radio 3 recording). Unlike them, this is a chamber opera, for five singers and string orchestra. MacMillan and his librettist, Michael Symmons Roberts, proportion the work appropriately, the drama on a modest and domestic scale, and the duration less than three quarters of an hour. Unsurprisingly, the composer opts for a religious theme, a story taken from the book of Genesis about a visit by three travellers to the home of Abraham and Sarah. Over the course their exchanges, it becomes clear that the travellers are angels on their way to the cities of Sodom and Gomorrah. Although little happens, there is plenty of psychological nuance here for the composer to address. Sarah is told by the travellers that she is to have a child, despite her advancing years, an issue that keeps her preoccupied from then on. Abraham intercedes on behalf of the residents of the doomed cities, and with some effect, though he is left feeling he could have done more. The sheer abstraction of the setting is problematic. The composer suggests in the liner note that there is something “terroristic” about the travellers, offering a tenuous thread of contemporary relevance. In fact the abstraction is well handled in the music, which includes some passing references to Middle Eastern scales and folk styles, but otherwise leaves the setting open. The drama then is mostly verbal in nature, but proves ideal for the scale and scope of MacMillan’s musical intentions. He sets the words in a direct way, declamatory and clear with few melismas or decorative indulgences. Even without the visuals, the characters are well defined and the exchanges easy to follow. The string orchestra provides an imaginative support, more often than not confined to the lower registers to provide bass lines and varied accompanying textures. The harmonic language is fairly consonant, with both aggressive dissonances and explicit tonal harmonies reserved for key points in the drama. The work was co-commissioned by Scottish Opera, Chicago Lyric Opera, Royal Opera and the Britten Sinfonia. It was premiered as Covent Garden by Scottish Opera, who then toured their production to Scotland. This recording is taken from the Chicago performances, which were apparently of a completely separate production with a new cast. The recording was made live from three staged performances. That’s never ideal, but the engineers do a good job of capturing the voices without any recessing apparent. The cast is strong, especially David Kravitz and Christine Abraham in the roles of Abraham and Sarah. Given the scale and duration of the work, their stamina is never tested, yet there are significant demands in terms of range and of tonal control at quieter dynamics, none of which pose either of them problems. The only disappointment here is the filler. For the Scottish Opera production, the short work was presented as a stand-alone, but in Chicago it was decided to prefix it with Schubert’s Hagars Klage. A common biblical source links the two, but no other connections are apparent. The Schubert was apparently integrated into the staging, with Michelle Trainor singing both the lament in the role of Hagar and taking that role in the MacMillan. The Schubert is sung in English and presented in an orchestration that supplements the original piano with the string orchestra. All this may have made some sense when staged live, but on record it all seems somewhat irrelevant. The string arrangement makes Schubert’s already baggy hybrid work seem even more diffuse, and the tessitura of the solo part is too high for Trainor, who struggles in many of the higher-lying passages. It is a shame that the Schubert comes first, and that it lasts for a full quarter of an hour. But once we are past that, the rest of this recording is well worth hearing. MacMillan doesn’t offer anything radical, and he deliberately limits the scale of his ambitions in every sense. Yet those ambitions are all met, and the result is a chamber opera that translates successfully to the audio medium, and that is well served here by both the performance and the recording.